From teens to adults, nearly everyone has or will experience a bout with pimples at some point. While the bright red bulbs often seem to crop up overnight, they unfortunately take longer to heal completely. However, there are a variety of at-home treatments you can try to treat the blaring red inflammation that often makes pimples appear so unsightly. These seven home remedies answer the question how to get rid of a pimple overnight and will help you feel a little more like yourself in no time. Effectively treating pimples requires that you first understand the issue. Blemishes are an inflammatory condition of the skin in which one or several of your oil glands becomes infected. The infection causes inflammation or swelling as well as the development of pus in the gland – giving pimples their characteristic swollen, red appearance. In most cases, excess oil being secreted by the oil glands is the primary cause of acne. The most common locations of pimples include the face, neck, back, and shoulders. Acne is often exacerbated by hormonal changes, poor hygiene habits, and excess sweating. An effective at-home alternative to cortisone shots, hydrocortisone cream can reduce the appearance of a breakout by nearly 80 percent. In fact, dermatologists suggest that the cream can actually reduce the redness of a breakout and make it significantly flatter overnight. It is important to keep in mind that this is not a treatment you want to use all the time, though, as it can lead to thinning of the skin and contribute to more active breakouts. To use the cream, simply apply a small dab directly to the blemish at night and then again in the morning. To be clear, popping an aspirin like you would for a headache won’t do much for your face; however, if you crush one up and apply it to the blemish, it may be just what you need. Aspirin is a salicylic acid derivative and may take some of the swelling and soreness out of a pimple. Aspirin is a naturally anti-inflammatory, so it can calm an angry pimple overnight. To give this remedy a try, crush an aspirin into a fine powder, then add a small amount of water – enough to make a paste. Apply the paste to the affected area, and leave it overnight for simple solution for how to get rid of a pimple overnight. Known as an effective treatment for everything from insect bites to athlete’s foot, tea tree oil is also an idea remedy for zits. The oil has potent anti-inflammatory and antibacterial properties that enable it to reduce inflammation while it also clears infection, so it reduces the appearance of a pimple while it treats the source of it as well. To use the treatment, you’ll want to dilute it until you know how your skin reacts to the oil. Combine 1-2 drops of tea tree oil with 1 teaspoon fractionated coconut oil and apply the mixture to the blemish. Using the oil undiluted may cause irritation that actually makes the pimple appear worse than it is. 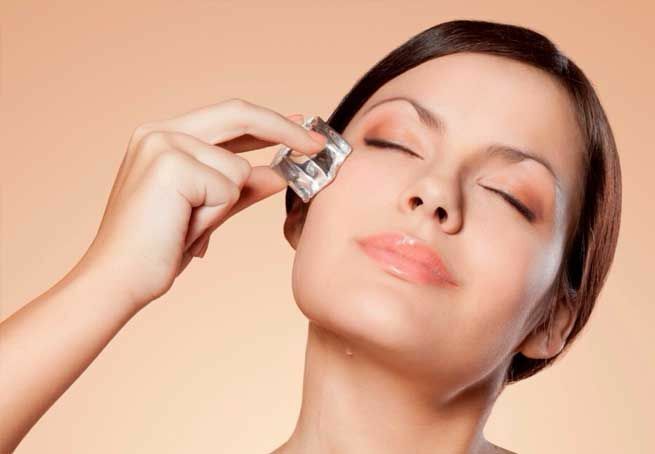 Ice is a pimple remedy that can be used to reduce inflammation and redness almost instantly. Applied to an aggravated pimple, ice helps to promote blood circulation, tighten the pores, and cleanse oil and dirt accumulated in and under the skin. To treat a blemish with ice, simply wrap an ice cube or a tablespoon scoop of crushed ice in a dry, clean cloth. Gently hold the ice against the affected area for a few seconds at a time. Repeat the process as necessary until the pimple has reduced in size and appearance. Ice is one of the best answers for how to get rid of a pimple overnight. Lemon juice is rich in antioxidant vitamin C, so it helps dry zits up faster. It is also a natural antibacterial agent, so it helps treat the infection and heal pimples more quickly, making it one of the best options for how to get rid of a pimple overnight. Fresh lemon juice is best, as bottle juice often contains preservatives that can irritate the skin and make the natural antioxidant properties less potent. To use lemon juice, simply dab a clean, dry cotton ball into a small amount of the juice and apply it to the affected area like an astringent. Let dry overnight and apply again in the morning. A natural powerhouse for treating a wide variety of ailments, garlic is an ideal solution for stubborn acne. A natural antiviral, antifungal, antiseptic, and antioxidant agent, garlic attacks pimples from all sides. Not only that, but the naturally-occurring sulfur in garlic also promotes fast healing. Reapply the treatment several times throughout the day and add this solution to your list of options for how to get rid of a pimple overnight. Steam is an affective facial treatment even if you don’t have pimples, but if you are dealing with a stubborn breakout, it’s a gentle, yet effective treatment option. Steam allows your pores to open, naturally releasing oil blockages and bacteria that have gotten trapped in your pores. The steam also helps to moisten your skin, so your face will appear refreshed. To use this remedy, fill a large bowl or container with steaming hot water. Place your face over the water, covering your head with a towel or cloth to enclose the steam. Allow the steam to engulf your face for several minutes, and then rinse with lukewarm water. Pat your face dry and apply a gentle, oil-free moisturizer. Pimples are pretty much a fact of life; however, there are several effective ways to treat them. And the best part is, you don’t even have to rely on expensive over-the-counter or prescription options. Many of the best solutions for how to get rid of a pimple overnight are items you already have in your kitchen or bathroom.